A three-day visit to Yellowstone National Park makes it possible to see the main highlights without the pressure to do a lot of driving every day. (Keep in mind that in a driving tour of Yellowstone, the driver rarely gets to enjoy the scenery.) Of course, depending on where you are staying the night, there may be considerable commuting to and from where you start and finish the day. Like the suggested Two Day Itinerary, Day One begins with Old Faithful and a stop at the Visitor Center to get the predicted times for major geyser eruptions. Everyone can and should see Old Faithful, but catching others, such as Grand, Daisy, Castle, Riverside, and Great Fountain, is a matter of luck and some planning. Day Two and Day Three are really interchangeable. Day Three is relatively short, and some might prefer to make it the middle day of a three-day tour. Geysers: The first day involves very little driving and quite a bit of walking – the only way most of the geysers and other hydrothermal features can be seen. The itinerary allows for the waits that are almost always necessary to see geyser eruptions. Old Faithful (eruption + Visitor Center) 90 min. Firehole River Walk (several major geysers) 90 min. (Drive — Black Sand Geyser Basin, 2 miles) 5 min. Black Sand Geyser Basin Walk 20 min. (Drive — Midway Geyser Basin, 5 miles) 10 min. Midway Geyser Basin Walk 30 min. Lower Geyser Basin: Fountain Paint Pot 45 min. The Northern Loop itinerary includes many different kinds of hydrothermal features, as both Norris Geyser Basin and Mammoth Hot Springs are geologically unusual. From Mammoth the route travels the Northern Loop across the Blacktail Plateau and the lower Northern Range. This is rugged sagebrush country, home to many animals. 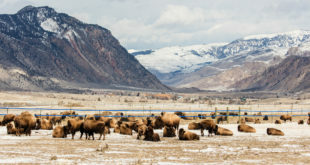 During early season (May-June) a side trip of about thirty miles out and back on the Northeast Entrance Road to the Lamar Valley is highly recommended for those interested in seeing bison, elk, antelope, and possibly wolves. The route joins the Yellowstone River canyon at Sulphur Springs, then climbs steeply to Dunraven Pass on Mount Washburn (true alpine country). The day ends at Canyon Village and the new Canyon Visitor Center, which provides an excellent overview of the geology of Yellowstone. Norris Geyser Basin: Porcelain Basin Walk 45 min. Norris Geyser Basin: Steamboat Geyser 15 min. (Drive — Mammoth Hot Springs, 20 miles) 30 min. Mammoth: Upper Terrace Drive 30 min. Mammoth: Lower Terrace Walk 20 min. (Drive – -Tower/Roosevelt Junction, 18 miles) 30 min. Sulphur Springs Overlook 30 min. (Drive – Dunraven Pass, 10 miles) 20 min. (Drive – Canyon Village, 7 miles) 15 min. Canyon Village: Canyon Visitor Center 30 min. -Day Three returns to the Canyon Area to see the Grand Canyon of the Yellowstone by morning light, and then continues through Hayden Valley, where bison and other animals can often be seen in the hills and along the river. Hayden Valley has two other stops: the unusual Mud Volcano Area, and a quick jaunt down the Le Hardy Rapids Walk. Just down the road, Fishing Bridge or Lake Village provide good locations for lunch with a view. Then it’s on to West Thumb Geyser Basin for a leisurely walk among geysers on the lake shore. This is a relatively short day, which leaves plenty of time for side trips or a nap on the beach. Canyon: North Rim Drive, several points 45 min. Canyon: South Rim Drive, several points 30 min. (Drive — Hayden Valley, 4 miles) 10 min. Hayden Valley: Overlooks, bison herd 15 min. Mud Volcano Area: Mud Volcano Walk 30 min. Le Hardy Rapids: Le Hardy Rapids Walk 15 min. (Drive — Fishing Bridge or Lake Village, 3 mi.) 10 min. (Drive — West Thumb Geyser Basin, 21 miles) 30 min.